TouchPoints for Women puts God's answers to your most pressing questions right at your fingertips. Inside, you'll find answers, words of encouragement, and Bible promises on nearly 150 alphabetically arranged topics - from affection, belonging, and contentment, to disappointment, loneliness, and security. Whether you read this book straight through or use it as a handy reference guide for those days when life throws you an unexpected curve, you'll be amazed at the impact God's Word can and does have on your everyday life. Touchpoints For Women by Brian R Coffey; Jonathan Farrar; Jonathan Gray; Rebecca Beers; Sean A Harrison; V Gilbert Beers was published by Tyndale House Publishers in May 2012 and is our 2622nd best seller. The ISBN for Touchpoints For Women is 9781414320199. 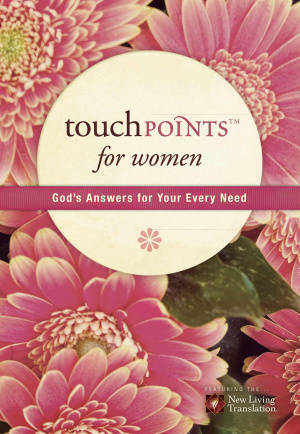 Be the first to review Touchpoints For Women! Got a question? No problem! Just click here to ask us about Touchpoints For Women.